Jerry De La Cruz (b 1948, Denver, CO) is listed among the three dozen most influential regional artists of the twentieth century (Denver Post survey of regional curators). In 2015, as one of four annual exhibits, the Museo de las Americas in Denver, Colorado honored the artist with a museum-wide retrospective of his work, featuring over 90 works and a 250 page limited edition catalog. At the first International Latino Art Auction held in Phoenix, AZ in conjunction with Sotheby's (2003), De La Cruz proved the best selling artist of the auction and drew the highest auction price for a single work. The Denver Art Museum's first purchase of a living Hispanic's work for its permanent collection was a De La Cruz. Years later, he was the only artist considered when that same museum wanted to commission a contemporary digital work commemorating the opening of its new Libeskind Building (2007). 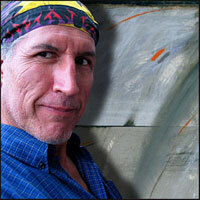 De La Cruz was the recipient of back-to-back artist in residency grants from Colorado in his early career and received as well their very last painting fellowship in 2000. Other honors include award of Best Art Event of the Year by Westword Magazine and appointment to Denver's Commission on Arts and Culture. De La Cruz currently splits his time between his studio in the Santa Fe Arts District in Denver, Colorado and his new studio in the Wynwood Arts District of Miami, Florida.